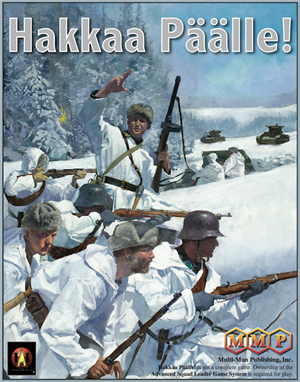 The 2 Half-Squads: Advanced Squad Leader Podcast: 138: Hakkaa Paalle Finnalle! ASL burnout...yikes...it happens, but it also passes quickly Jeff. Forget about the dice, the rules and the feeling that you can't put together a workable strategy and remember what drew you to the game and the aspects of the play that you really enjoy. Focus on those things. Heck I lose all the time and the dice betray me with frightening regularity. But watching my German grenadiers trying to stop a wild charge of Cossacks or my single German squad standing its ground in a road hex to stop a charging Sherman tank....man this is why I play!!! I have a job that occupies nearly all of my life and each Friday night I am able to jump into an ASL game and forget all the work and life worries that normally assail me...and for three hours I'm a Kampgruppe Commander in the Russian Steppes, the Italian Hills, or the Normandy Bocage. Win or lose...it's a great ride. Here's hoping the fire lights once again and you find yourself strapped into a King Tiger facing the Soviet Hordes!!! Say it ain't so Jeff! Like "Grumble" says... it passes! Read the posts on Gamesquad... ASLers who quit, then come back. This too shall pass!! Grumble and Jack, thanks for writing and encouraging words. In fact, we just recorded episode 139 and had a blast! And we're scheduled to play a scenario this Monday. Maybe Jeff is healed -- or bipolar! Or could it be that Dave is just so lovably irresistible? PS Dave and Jeff, I've got my wife hooked on your show as well. She loved Jeff's, "he can twist animals into the shapes of balloons." So even non-ASL'rs can enjoy your podcast...and I swear I didn't tie her up and make her listen...it was purely voluntary...mostly. We messed up on the number for air support. It is 137 and 138. 138 has the AA fire portion. You can always check the show notes listed on the site for content and times. The group play thing looks great. We will be covering that in a future show.